Blurb: The last thing Lacey Gordon—divorced with a teen daughter and two cats—needs is a rescue dog coming into her life. To top it off, she's rooked into a "Get Under the Mistletoe by Christmas Eve" dating contest. 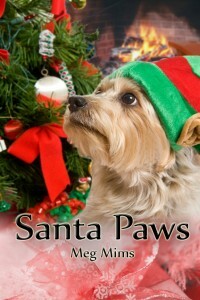 Since Buddy the dog prefers to be the only "new guy" in Lacey's life, will Santa Claws ruin her holiday for good? My Review: I really enjoyed this sweet novella and particularly the mother/daughter relationship between Lacey and Deena. Lacey has so much on her plate raising a daughter alone and dealing with a difficult ex, she is a real hero for taking in a problem pup in desperate need for a home. Deena's baggage going back to being bit by a pit bull as a child made for great conflict when she begins getting frustrated by Buddy's antics and wants to give up on him, which Lacey admirably won't let her do. A very sweet romance develops over mochas lattes when Lacey meets Reuben during a disasterous dating contest. Four legged family members sometimes make the best matchmakers! Buy for 99 cents here.